The camshaft can be viewed as the brain of the engine. Its profile dictates when and for how long the intake and exhaust valves open and close, which is a major factor in how the air/fuel package enters, remains in, and exits the cylinder. Today’s cam technology has made great strides in engine performance and fuel efficiency. 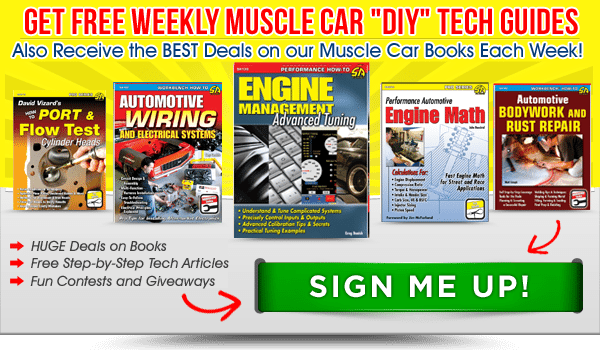 You cannot use roller lifters with a flat-tappet cam, nor can you use flat-tappet lifters with a roller cam (unless you enjoy destroying your cam and anything else in its wake). The 4/7 swap cam (center) and the LS cam (right) feature the second and fourth lobes from the front in an opposed position compared to the stock firing order cam. 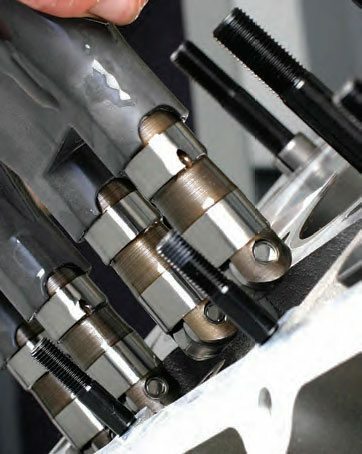 Rather than featuring the same ramp angle on each side of the cam lobes, asymmetrical camshafts feature different angles on each side of the cam lobes that allow cam designers to“fine tune” valve opening and closing rates. A flat-tappet cam uses lifters that rub against the cam lobes (with an oil film in between). These lifters are designed to rotate in their bores in order to continually spread the load around the lifter face (if the lifter can’t rotate, frictional wear concentrated across one path causes the lifter/lobe to wear prematurely). A flat-tappet cam’s lobes are slightly tapered to promote lifter rotation. 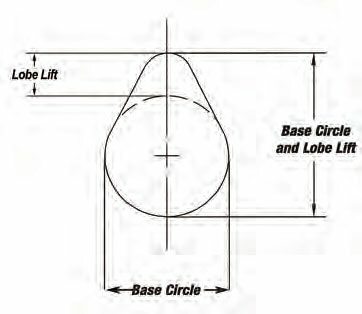 While flat-tappets have a narrower radius at the peak of the lobe, roller cams require a large-radius lobe peak to maintain full lifter roller contact with the lobe. If the lobe had a narrow (small) radius, the roller jumps and chatters as it rides past the peak. Roller lifters need a nice, flat surface to continually ride on the lobe. One advantage of roller cams/lifters (in addition to reduced friction) is that rollers hold the lifter at max lift for a longer duration, which helps to load the cylinder with more air/fuel. Roller cams utilize lifters that are equipped with a roller bearing that rolls against the cam lobe. They require a flat (non-tapered) surface on the lobes and virtually eliminate lifter-to-lobe friction and wear. Roller lifters can handle much more abrupt transitions from base circle to ramp to lobe peak, and can hold the lifter at maximum lift for a longer period of time. For performance and durability, roller cams offer distinct advantages over flat-tappet cams. Bridged roller lifters install as a pair. During test fitting, make sure that the antirotation bar clears the lifter bosses when each lifter is on the cam base circle. If the design uses OEM “dog bones,” the OEM dog bone is dropped onto the lifter pair. This single guide prevents the pair of lifters from rotating. For retrofits (when installing a roller cam in an engine that originally used a flat-tappet cam) or for engines that originally used a roller cam with lifters guided by dog bones, performance aftermarket roller cam kits are available with bridged lifters. Roller lifters have a roller bearing and trunnion. OEM roller lifters may be adequate for most street applications. However, if you’re building an engine with increased spring pressures and abrupt closing ramps, you need something beefy. Toss the OEM stuff and grab a set of heavy-duty aftermarket roller lifters that are designed for severe duty. Since the dog bones need to be secured to hold them in place, a spring-tempered sheet-metal securing plate is mounted to the lifter valley floor, featuring extended tension “fingers.” Each finger presses down onto the center of each dog bone to prevent the dog bone from popping loose. Overhead cam engines use cam followers (no pushrods) that directly activate the valves from the cam lobes. 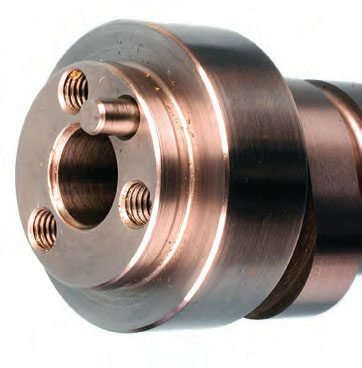 For a high-performance build, full-roller cam followers greatly reduce friction and allow higher RPM, greater efficiency, and much longer life. These are Crane Cams intake and exhaust cams, adjustable cam timing gears, and Ferrea alloy full-roller cam followers for a Honda race engine. Another advantage offered by roller cams relates to long-term service. A flattappet cam establishes an individual wear pattern between each lobe and its lifter. If you plan to use the original lifters, they must be re-installed in the original positions. Otherwise, buy a complete set of new lifters to use with the existing cam. Since there’s no wear pattern established with a roller cam, you can mix up roller lifter positions, or replace one lifter at a time, etc. A traditional symmetrical camshaft has the same shape/angle on both sides of the lobe, which causes the valve to open and close at the same rate of speed. Asymmetrical cams have lobes with different ramp angles/shapes on each side of the lobe. Cam manufacturers can offer cams that open and close valves at different rates so they can be designed to super-tune valve operation for maximum performance. Once a secret of high-end rollercam race engine builders, asymmetrical cam profiles have become fairly commonplace in even performance street engines. Today this asymmetry aids in optimizing valvetrain dynamics by tailoring how fast the valve opens, while avoiding undue stress to the valvesprings, and how quickly the valve closes without banging/shocking the valve at its seat. 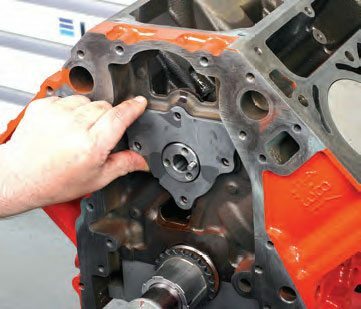 The approach of using different profiles on the opening and closing sides of the lobe allows engineers to tailor the valvetrain to optimize specific engine requirements. Due environmental concerns the EPA mandated a substantial reduction of ZDDP, which is a critical protection agent in the oil mix. The EPA also eliminated ZDDP in standard engine oils that are intended for the late-model production engine with a roller-style camshaft. Your oil must contain enough ZDDP to adequately protect the flat-tappet cams during break-in and for long-term engine operation. It’s vital to protect the flat-tappet cam-lobe wear during the break-in period or your entire engine can be ruined. ZDDP is an essential compound for high-performance engines with aggressive cams and high-spring loads. Roller cams are not impacted because the rollers don’t produce nearly as much friction and have no real scuff-wear issues. The EPA has directed the oil manufacturers that they can ignore older (i.e., flat-tappet cam) engines, and provide an oil that avoids converter damage so emissions are reduced. As a result, collector-car owners were left without a viable alternative. 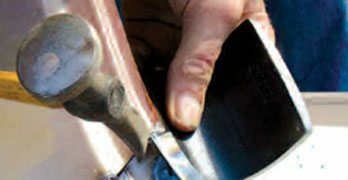 To help ensure flat-tappet cam lobe damage does not occur, apply the specific cam lobe and lifter assembly lube that’s recommended by the cam manufacturer. Many engine builders also install valvesprings with a lower rate (lighter pressure) for the break-in phase, switching to springs with a higher rate after break-in has been accomplished. You can use a lighter valvespring for break-in to help guard against lobe damage during breakin, but this isn’t a definitive solution. It’s imperative you use a dedicated break-in engine oil and a ZDDP additive. Before attaching the timing chain (or belt), always check camshaft endplay with a dial indicator. Generally, endplay should be somewhere in the range of approximately .003 to .006 inch. With a handle/grip attached to the cam you greatly reduce the risk of damaging cam bearings. Select and use a mineral-based engine oil (preferably a non-detergent oil in the 30W or 10W30 range), plus a 16- to 20-ounce bottle of specialty ZDDP additive. In order to provide long-term protection for a flat-tappet camshaft: Use a specialty engine oil that contains high levels of ZDDP (around 10,000 to 12,000 ppm). These are offered by companies such as Mobil 1, Redline, Joe Gibbs, and Brad Penn. Use the engine oil of your choice, plus a bottle of ZDDP additive with every oil change. For break-in of flat-tappet engines, avoid any engine oil with the API logo on the container. The small starburst indicates that the oil has been formulated for new engines, from an energy-conserving standpoint. It is for passenger car gas engines equipped with roller cams. Check any cam (new or used) for runout. 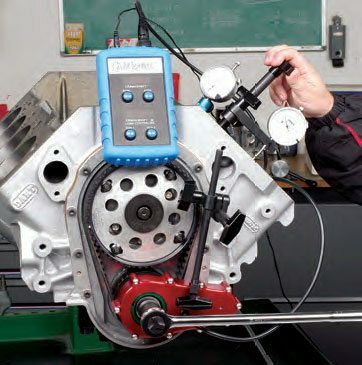 Rest the camshaft on a pair of clean V-blocks; a roller-bearing cam checker stand is ideal. Position a dial indicator on a stand that is rigidly secured at the base at the camshaft’s center journal. Preload the dial indicator plunger against the journal by about .050 inch, and then zero the gauge. Slowly rotate the camshaft while observing the indicator gauge. Maximum allowable runout is about .001 inch. If runout is excessive, it’s best to replace the cam. Before installing any cam, you must lube the journals and lobes (and distributor drive gear if applicable). A high-pressure lube is needed to protect lobes during break-in. 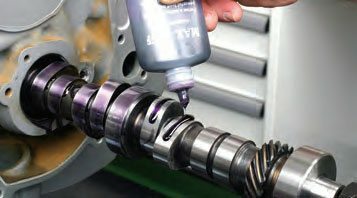 While the choice of lube isn’t as critical for a roller cam, when dealing with a flat-tappet cam always use the specific cam assembly lube specified by the cam manufacturer. Insert the cam slowly. Each time one of the journals exits a cam bearing, the cam is no longer guided and can drop in the bore. 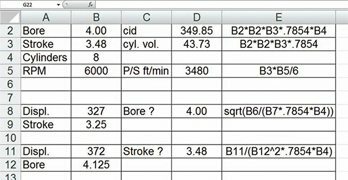 Carefully align each journal during cam bore entry. If the cam stops, never try to force it. Gently lever it until you achieve a smooth entry into the next cam bearing. 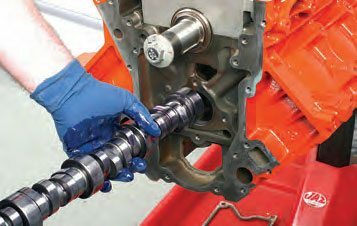 Check camshaft endplay when the camshaft has been installed for a test fitting and before lifters are inserted. Set up a dial indicator at the cam nose if held by a retaining plate or onto the face of the cam gear. Push the cam inboard until it stops. Adjust the indicator plunger for (about .050 inch of preload), and then zero the gauge. Pull the cam forward and observe the amount of travel on the gauge. Check with your engine’s specs, but in general you should have something in the range of .003 to .006 inch. 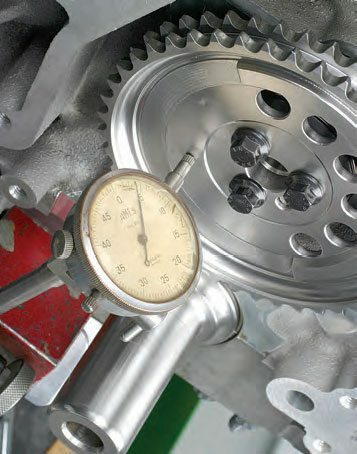 You can’t assume the cam timing is correct, so you need to degree the cam, ensure it’s machined correctly, and be sure that the timing marks on the cam and crank gears are precise. This simply means that you make precise measurements to both verify the cam profile and to properly phase the cam timing with the piston positions in order to take full advantage of the performance that the cam has to offer. The quality of today’s performance cams isn’t in question because Crane, Comp, Bullet, Lunati, Crower, etc., utilize the latest computer imaging and precise CNC machining centers. The reason to take the time to degree a cam has more to do with crank and cam timinggear timing-mark precision, checking for incorrectly machined cams or crank keyway locations, and stack-up of machining tolerances. If you install a new cam and simply align the timing marks on the gears, the engine likely runs just fine. But if you want to know what’s going on and you want to maximize the potential of the new cam, taking the time to perform a degree check is critical. 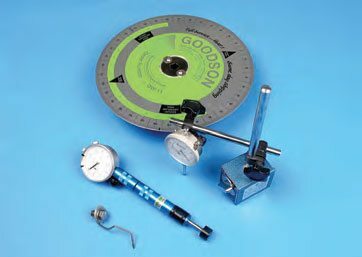 Pictured here is a Goodson degree wheel, a dial indicator with adjustable stand, a homemade wire pointer, and a Foster lifter gauge. If you rotate the crank too quickly or use a jerking motion, you can easily run past your intended point. If this happens, start over by rotating in the normal direction two more times. If you rotate in the opposite direction to try to hit your missed target, slack in the timing chain results in a false reading. A typical cam card. When degreeing the cam, use the card as your reference. Always keep a cam card in your files. This provides a handy reference in the future if you decide to swap cams. Here’s a high-tech way to degree your cam, using positioning sensors and a digital control box. This is Cam Logic’s system, including a crank-mounted encoder, digital display unit, cam lobe dial indicator, and a piston indicator. 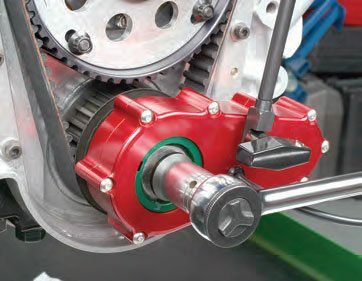 In order to degree the cam, use a large-diameter degree wheel, a piston stop, and a dial indicator mounted to an adjustable stand. Also use a pointer that bolts to the front of the block and extends to the edge of the degree wheel (most people use a piece of coat hanger wire with one end sharpened to a point and the other end looped to allow boltmounting). 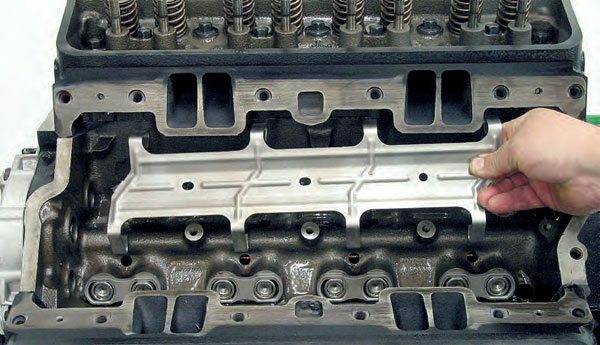 The short block must be assembled, including main bearings, crank, rods, bearings, pistons, camshaft, timing gears, and chain or belt. Depending on the design of your degree wheel, you can fasten it to the crank snout or install a crank balancer to allow wheel mounting. With the wheel and pointer mounted, rotate the crank until the number-1 piston is at TDC. Align the pointer to the TDC mark on the degree wheel. Next, in its typical direction of rotation, rotate the crank until the piston is halfway down the bore. Install a piston stopper to the block deck at the piston bore. You simply need something that the piston can stop against. 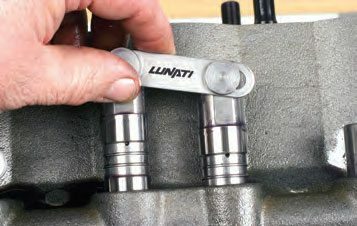 You can purchase a piston stopper tool. It’s a bridge that bolts to the block deck and has a centermounted, adjustable bullet-nosed stopper. Or you can fabricate a stopper by using a piece of hefty 1/4-inch-thick (or more) piece of steel or aluminum flatstock with a tapped hole in the center (thread size isn’t critical but, for the sake of example, let’s use a 3/8 x 24 thread). Radius the tip (simply to avoid nicking the piston) of a 3/8-inch x 24 bolt that’s about 2 inches long. Install a jam nut onto the bolt and run the nut toward the bolt head. Thread the bolt into the hole in the flat stock. Drill two holes in the ends of the flat stock to allow mounting to the block and mount the bar to the block, positioning the bolt at the center of the bore. Thread the bolt so it protrudes into the bore to a depth where you’re sure that the piston makes contact with the bolt when the piston is below TDC. Exact depth isn’t critical. Tighten the jam nut on the bolt. Carefully turn the crank in the typical direction until the piston contacts the stop. Note the reading on the degree wheel. Next rotate the crank in the opposite direction until the piston once again contacts the stop, and note this reading. If the crank stopped at exactly the same point at the end of each rotation, you got lucky and happen to have the degree wheel adjusted exactly at TDC. In the real world, however, the two readings are likely different. When the two readings (before and after TDC) are different, simply use the average, since true TDC is exactly halfway between the two readings. For example, if the pointer marks, say, 30 degrees after TDC at the first stop and 32 degrees at the second stop, the average of the two is 31 degrees. Simply adjust the pointer to the 31-degree mark on the wheel. Rotate the crank in the opposite direction until the piston stops, to verify your mark. The pointer should read (in this case) 31 degrees after TDC. In order to verify the setup, remove the piston stop, and install a dial indicator to locate the indicator’s plunger over the center of the bore. Or, depending on piston dome design, pick a spot where the plunger contacts a flat deck surface (quench area) of the piston. Rotate the crank clockwise until the piston is .100 inch below block deck. Note the pointer reading on the wheel before TDC. Slowly continue to rotate the crank clockwise. The piston reaches TDC and begins to run downward. Stop when the piston is again .100 inch below deck, and note the pointer reading on the wheel. The readings for BTDC and ATDC should be the same. 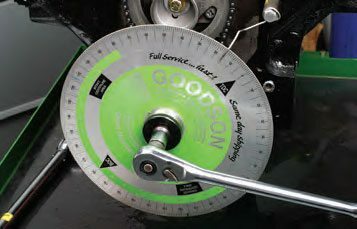 With the degree wheel adjusted properly, you’re ready to degree the camshaft. The procedure for finding lobe centerline is different for symmetric and asymmetric cams. Symmetric Cams: Although there are several methods that can be used to degree the cam, the centerline method is considered the easiest and most reliable. With the number-1 piston at TDC and the degree wheel’s pointer at 0 degrees, position a dial indicator with the plunger on the intake valve retainer. Make sure that the indicator plunger is parallel to the valvestem (not cocked at an angle). Rotate the crank clockwise until the camshaft’s number-1 intake lobe reaches maximum lift. Zero the dial indicator gauge (don’t disturb the plunger; simply rotate the gauge to zero). Rotate the crank counterclockwise until the dial indicator gauge reads .100 inch. Next, rotate the crank clockwise until the gauge reads .050 inch before maximum lobe lift. Observe and record the degree wheel pointer reading. Continue to rotate the crankshaft clockwise until the indicator gauge moves past zero to .050 inch on the closing side of maximum lobe lift. Record this reading on the degree wheel. 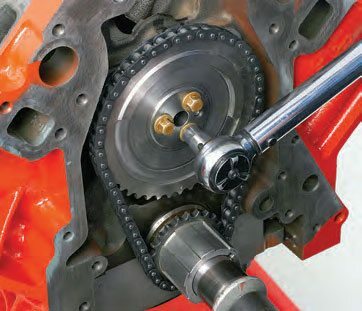 Rotate the crankshaft smoothly to avoid jerking and running past your desired marks. If you run past the target mark, start over. Don’t reverse direction to compensate, since slack in the timing chain affects your accuracy. Add the two numbers from the degree wheel readings and divide by 2. The result represents the location of maximum lift of the intake lobe in relation to the crank and piston, which is the intake centerline. 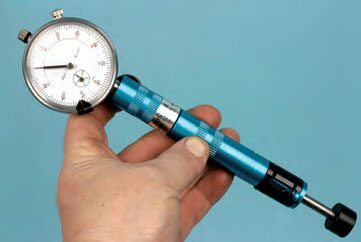 A dial lifter gauge, such as the one made by Foster Tools, allows you to directly read the camshaft lobe. Installed lifter gauge. This acts as a temporary lifter that directly follows the cam lobe profile. Crank position is constantly displayed, as is cam lobe position. The crank position encoder slips onto the crank snout (using one of their crankspecific keyed aluminum adapters). The encoder is then secured to the block face to prevent encoder body rotation. The digital display unit constantly monitors crank angle (top display) and camshaft lobe position (lower display). Using this system is surprisingly simple and quicker than using a degree wheel. For instance, if the first degree wheel reading was 100 degrees, and the second degree wheel reading was 120 degrees (100 + 120 = 220). Half of that number equals 110, indicating the cam’s intake centerline is 110 degrees. Compare this to the intake centerline listed on your cam card, which should be 110. Once you’ve determined what your cam’s intake centerline actually is, the next step is to find out how your cam is currently timed ( advanced or retarded). If the intake centerline is greater than the lobe center angle, the camshaft is advanced. If less, the cam is retarded. 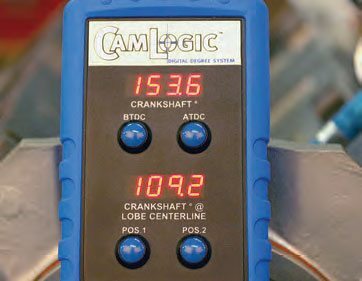 For example, if your cam has a 110-degree intake centerline and the lobe centerline is, say, 108 degrees ATDC, your cam is currently timed with 2 degrees of advance. 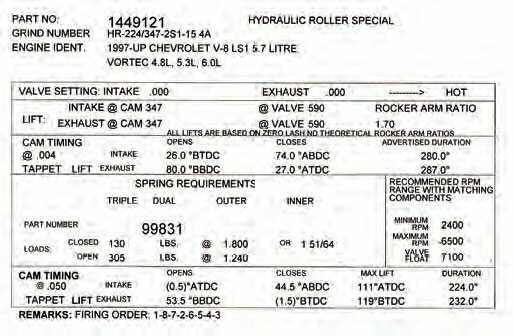 If the intake centerline is 112 degrees ATDC, the cam is 2 degrees retarded. 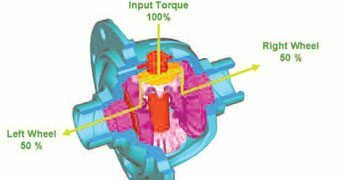 Advancing the camshaft opens and closes the valves sooner, which increases low-end torque. Retarding the cam sacrifices some low-end power but provides more top-end power. The only way to tune the cam timing to your preference is to test it. 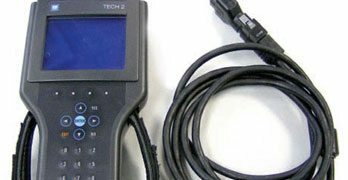 Dyno testing may get you into the ballpark, but the best test is always in the car, on the track (quite often what looks ideal on a dyno monitor isn’t what the vehicle needs for top performance on the track). Altering cam timing is relatively easy. Crank gears are available with multiple keyways (giving a choice of zero or advance/retard positions), and adjustable cam gears are available with increment references for adjustment. 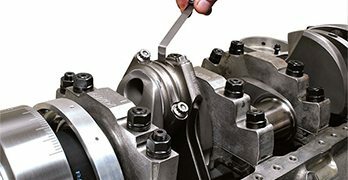 Asymmetric Cams: On an asymmetric cam the valve opening and closing rates differ on each side of the lobe, When degreeing this type of cam, take the lift reading directly at the lifter or cam lobe. 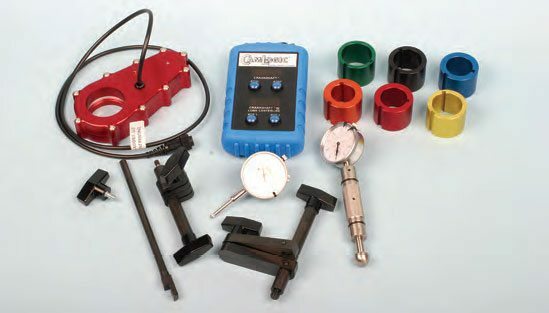 Either set up a dial indicator onto the lifter (on the edge of the lifter for a hydraulic roller lifter or in the pushrod pocket for a solid roller lifter), or use a cam lift gauge (such as from Foster Tools). This is a straight-bodied housing with a dial indicator gauge at the top and a spring-loaded plunger at the bottom. With the lifter removed, insert this gauge into the lifter bore, with the plunger contacting the base circle of the lobe (the shortest lift of the lobe). Finger tighten the gauge body base and zero the gauge. The gauge expands when turned and locks into the bore. It allows you to monitor cam lobe movement directly against the cam lobe instead of reading at the valve. Slowly rotate the crank clockwise, until the lobe rise indicates .050 inch on its opening ramp. Record the degree wheel reading. Continue to rotate the crank clockwise until the gauge reads .050 inch on the lobe’s closing ramp. Record the degree wheel reading. 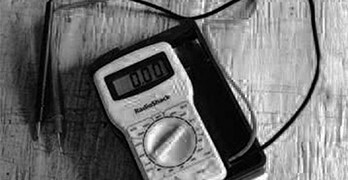 Compare your measured opening and closing wheel readings with the cam card. You can then determine if you want to advance or retard the cam. Advancing the cam helps to increase low-end torque by starting the intake opening sooner. Advancing also increases the clearance from the exhaust valve to the piston but decreases the clearance from the intake valve to the piston. 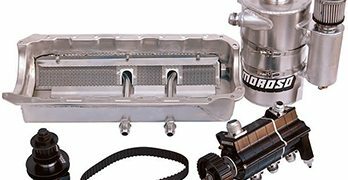 Retarding the cam increases high-end power by keeping the intake valve open longer. 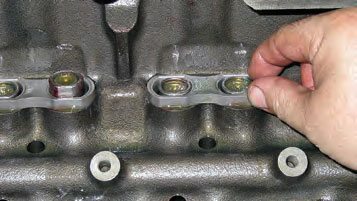 Retarding the cam increases the clearance from the intake valve to the piston but decreases the clearance from the exhaust valve to the piston. 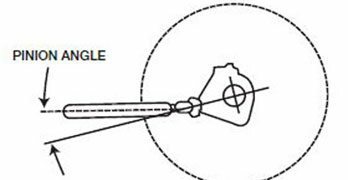 The lobe separation angle (LSA) can have a dramatic impact on performance characteristics. A tighter LSA decreases piston-tovalve clearance, places the torque curve on a lower RPM range, and increases maximum torque, but results in a narrow power band. A tighter LSA also helps to increase cylinder pressure because the transition time between valve opening and closing is shorter. It also increases the chance of detonation due to higher cylinder pressure and increased compression. A tighter LSA also reduces engine vacuum and idle quality. A wider LSA results in the opposite characteristics, including increased valveto-piston clearance, higher vacuum, less chance of detonation, etc. Performancewise, a wider LSA broadens the powerband, reduces maximum torque, and raises torque to a higher RPM range. In a nutshell, tight LSA is better for bottomend torque and wide LSA is better for high-RPM running. A nice compromise is an LSA of 110 to 108 degrees. All LS engines are designed to use roller lifters. 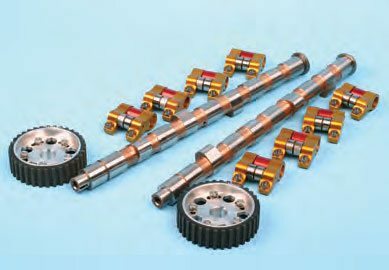 OEM lifters are hydraulic, but the performance aftermarket offers both hydraulic and solid roller cam lifter kits. The tray has four lifter bore cavities. Each lifter has two opposing flats at the top of the lifter body. These flats engage into flats in the plastic bucket assembly. These flats keep the roller lifters in plane with their cam lobes, preventing the lifters from rotating (same principle as using dog bones or bridged-pair lifters). Once the cam is installed, rotate it to verify smooth rotation. 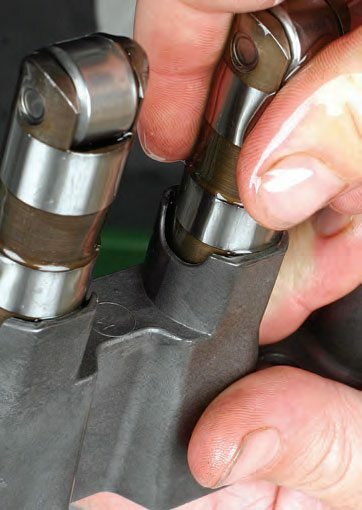 If the cam feels tight you may need to remove the cam, clean the bearings of lube, and relieve any high spots on one or more cam bearings with a bearing scraper. If you’re not experienced at this, it’s best to let a skilled shop handle this for you. Once cam installation is finalized, install the cam retaining plate (designs vary depending on engine design). In order to degree the cam, install the timing setup. With number-1 piston at TDC, align the timing marks on the crank and cam gears according to the OEM locations (usually the cam gear dot is at 6 o’clock and the crank gear is at 12 o’clock, but this can vary depending on engine design). Snug the cam gear bolts. Just remember to apply thread locker and to torque these bolts to spec once you’ve set your cam timing. Insert the bank of four lifters into each tray and lightly snap in place. Install the entire lifter tray assembly through a recess in the upper section of the block, and align the lifters into their bores. Secure the tray to the block with a center-located bolt. Install the lifters to the block before installing the head gasket because the head gasket and head traps the lifter assemblies. After the camshaft is installed, install the assembled lifter trays and bolt them to the block. Because the lifters were pushed up into the tray cavities, they’re held away from the cam. Simply use a pushrod to manually pop each lifter down to meet its cam lobe. The upper flat section of the lifters remain guided in the trays. A nice aspect of this lifter tray design has to do with future camshaft service. When you want to remove and re-install or swap cams, there’s no need to remove the intake manifold. Loosen or remove all rockers to remove all valvespring tension. Remove the pushrods. Rotate the crank two full revolutions. This causes the cam lobes to push the lifters far enough up into the buckets to hold the lifters away from the cam. Then remove the cam, insert the new cam, and pop each lifter down onto the lobes with a pushrod. Although this method usually works as designed, there is always the possibility that one or more lifters might fall out of the bucket retainer. If that happens, you are forced to remove the cylinder head(s) in order to remove the buckets, retrieve the lifter, and re-install. As a safety measure to avoid this concern: Once all lifters have been popped up into the buckets and are away from the cam lobes with the camshaft retainer plate removed and before removing the camshaft, insert a pair of 1/4- or 5/16-inch-diameter metal rods at lengths of about 24 inches into the two oil galley holes located just above and at each side of the front camshaft bore. Insert these rods all the way through the block until they gently bottom-out. Now you can remove the cam without the worry of lifters dropping into the cam bore. Once the cam has been replaced, remove the rods and use a pushrod to pop each lifter down. Inserting these temporary rods avoids the potential for any of the lifters to accidentally drop out of their trays. Every engine is designed with a specific cylinder firing order. However, special camshafts are available to alter the original firing order. Primarily intended for specific racing applications, a special firing order (SFO) camshaft is sometimes preferred, which allows the race engine builder to address certain combustion heat and crankshaft disturbance (harmonic) issues. The reason to alter the firing order is to obtain a smoother running engine with enhanced (even) fuel distribution, while increasing crankshaft and main bearing durability. Although slight horsepower gains may or may not be obtained in the process, the goal is to decrease engine harmonics. Although SFO camshafts were born from racing development, car manufacturers have adopted this concept. For example, General Motors has taken advantage of this for Gen-3 and Gen-4 LS engines, in order to further reduce harmonics and increase engine durability. The LS camshafts have a 4/7 and 2/3 swap, from earlier-generation engine firing orders. When installing the LS lifters to the buckets, insert the lifters deep enough to snap them in place. In this up-position, the lifters are held away from the cam lobes. The lifter bucket holds a bank of four roller lifters with the roller tips in plane with the cam. Note the series of small tapered walls in the top of the lifter bucket; they are designed to help drain oil to the lifters. However, this OEM design still tends to hold too much oil and drains slowly. A simple mod involves drilling a couple of 5/16-inch holes around the base of the cavity for faster oil drain. Flat-tappet cams have lobes that are slightly tapered, to force the flat-tappet lifters to rotate. This lobe taper also causes the cam to walk fore/aft slightly. Since a roller cam doesn’t need (and can’t use) this taper, a roller cam needs a method to prevent this walk. Many roller cams have a stepped nose, designed to be stopped from walking forward by a retainer plate. 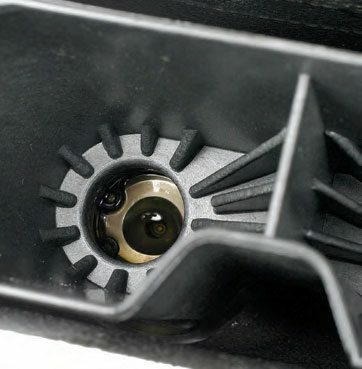 Otherwise, a cam button is needed; this drops into the center of the cam nose and takes up the space between the cam nose and the rear of the timing cover. 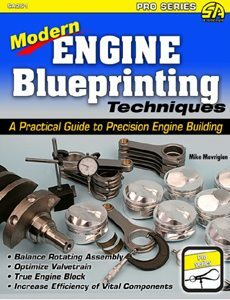 In racing applications, the benefit of using a special firing order addresses the needs of engines that tend to operate at peak engine speeds for extended periods of time (such as endurance racing), and for engines that are called upon to produce peak power very quickly (such as in drag racing). Crankshaft harmonics are often caused when two adjacent cylinders are firing in close succession. By relocating the firing order, it’s possible to create a smoother operation and enhanced acceleration curve. For comparison, let’s compare the firing order between early-generation Chevrolet V8 engines and the later LS platform. Early small-block and bigblock engines had a firing order of 1-8- 4-3-6-5-7-2. 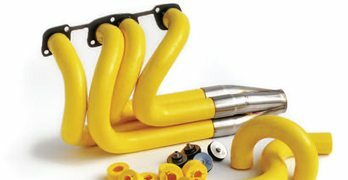 With this firing order, a companion cylinder reaches TDC at the same time as its counterpart, one on the power stroke and one on the exhaust stroke. The LS engine, as an example, swaps cylinders 4 and 7, thereby creating a new firing order of 1-8-7-3-6-5-4-2. In certain drag race engine applications, a 4/7 swap helps to reduce fuel distribution and heat issues that may have previously been caused by cylinders number-5 and -7 firing in succession. Changing the firing order is not a matter of simply repositioning the spark plug wires, however. In order to alter the firing order, a special camshaft is required. With the special firing order (SFO) camshaft in place, you must then remember to arrange the spark plug wires in the corresponding order. Most leading race camshaft manufacturers offer SFO camshafts for those who wish to perform this change. You have a choice between conventional babbit cam bearings and needletype roller cam bearings. As with most mods, each has its pros and cons. The advantages of moving to needle bearings in the cam bores include less friction at the cam journals and a more precise maintaining of the camshaft centerline during engine operation. 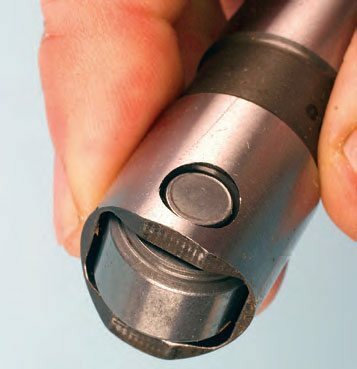 A conventional babbit cam bearing has an oil hole, allowing oil to lubricate the cam journal. The oil clearance between the cam journal and the bearing is filled with oil so that, during camshaft rotation, the cam journals ride on a film of oil (just like rod and main bearings do). A camshaft needle roller bearing allows the cam to ride directly on the bearings. Oil splash is sufficient for lubrication, and the needle bearing housing blocks off the cam tunnel oil passages, so there is a slight reduction of oil temperature. In order to install camshaft bore needle bearings, the cam bore diameter must be increased to about .040 inch. The result is about a .002-inch interference fit for the bearings. This must be done on an alignment boring fixture (or in a CNC machine). 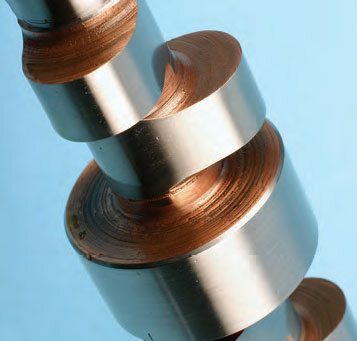 Needle bearings require a camshaft with large-diameter journals (largediameter core). This results in a beefier cam core that is less prone to flexing, which is great when using ultra-highpressure valvesprings. The downside to needle bearings is that the labor and machining costs to modify a block to accept needle roller bearings is roughly $600 to $700. Aftermarket race blocks are available already machined for needle bearings but you must also run a steel-billet camshaft with needle bearings, which raises cost a bit more. A potential glitch is that needle bearings may promote more valvetrain harmonics than babbit cam bearings, where the cam journals ride on an oil film that helps to reduce harmonics. If you want the ultimate and don’t mind paying the price, needle cam bearings are the way to go. If you’re simply building a strong street engine where continuous high engine speed isn’t a factor, it’s a waste of money. Camshaft needle roller bearings are commonly available in sizes ranging from 50-mm ID with 58-mm OD to 55-mm ID with 63-mm OD. 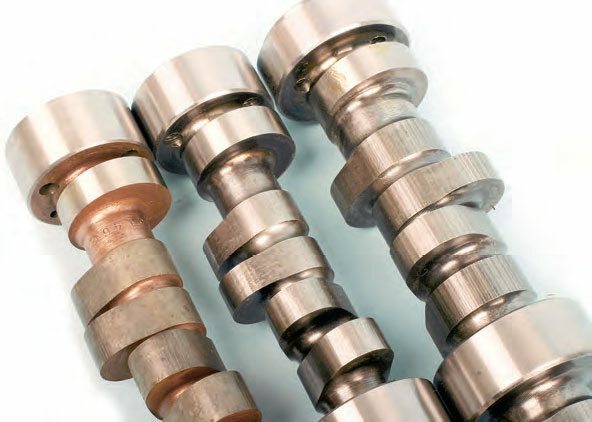 If you move to needle bearings, you must order a camshaft that has the appropriate-diameter journals. Matching the distributor’s driven gear (if your engine has a distributor) to the camshaft gear is important. Depending on gear metallurgy and compatibility, the gear on the distributor needs to be compatible with the type of metal on the camshaft’s distributor drive gear. If they’re incompatible, you can easily and quickly strip the teeth off the distributor, sending debris throughout the engine’s oiling system. If in doubt, a bronze gear is a safe choice, but remember that a bronze gear eventually wears and may need to be replaced once in a while. A better choice is one of the new poly gears that are compatible with all camshaft gear materials and last longer. This makes poly gears a good choice for the street. A hardened steel cam gear can quickly wipe out an iron distributor gear, sending plenty of debris throughout the engine. Don’t play guessing games; make sure that your distributor gear is compatible with the cam. Today’s steel roller cams are heattreat hardened to resist wear. As a result, you can’t use just any distributor driven gear. 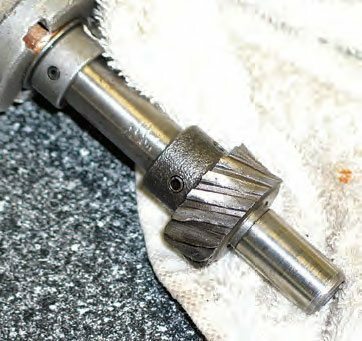 A sintered-iron distributor gear gets chewed up, sometimes even during engine break-in. Most manufacturers of steel cams recommend using a bronze or high-silicon copper alloy gear. Lunati also sells its Everwear distributor gear, which is a specially treated metal composite that is compatible with all steel cams. There is also a fairly new generation of “poly” gears that are compatible with any cam, regardless of the cam’s gear material. Composite distributor gears (made of carbon ultra-poly) offer strength and wear resistance. Bronze gears are great (and safe for the cam), but they eventually wear out, resulting in ignition spark scatter. 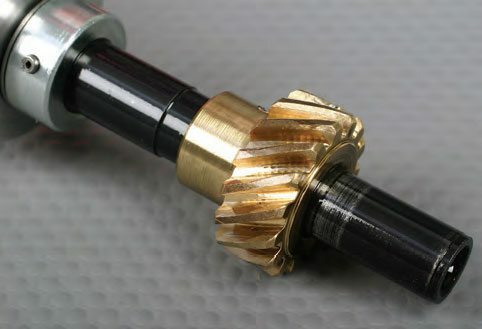 Bronze gears are fine for racing where the engine (and distributor) are serviced routinely. For street or racing, a poly gear is a safe choice that provides longer life. A common bronze gear costs around $45, while a poly gear can run a little more than $100. If you have a cast-iron camshaft, you can use a cast-iron gear or a composite poly gear. If you have a ductile iron camshaft, you can use a hardened steel or composite distributor gear. If you have a billet-steel camshaft, your best choice is a bronze gear or a composite gear.